Just one click to transfer contacts,contacts blacklist, text messages, photos, videos, bookmarks, voice memo, call logs, apps, music and calendar between iOS(iPhone), Android(Samsung), Windows phones, Nokia and BlackBerry. It is said that the Samsung Galaxy S9/S9+ will be release soon. As a Samsung fans ,you must want to buy it. If you are not the fans of Samsung, I think you may be attracted by the powerful configurations that it have Iris recognition, face recognition and Snapdragon 845 processor. Cellphone is one of the most important and convenient tool in our life at present. There is no doubt that we will restore some material in our mobile phone. It is a pretty happy thing to buy a new phone. However, there is a situation we must face is that how to transfer the data such as photos, contacts and other personal files to the new cellphone. Such powerful performance has caused many old iPhone users to move to the Samsung camp. But, it is a pity that you don't know how to transfer the personal data from old iPhone to new Galaxy S9/S9+. Please don’t worry, here I will introduce a powerful data transfer software to you. 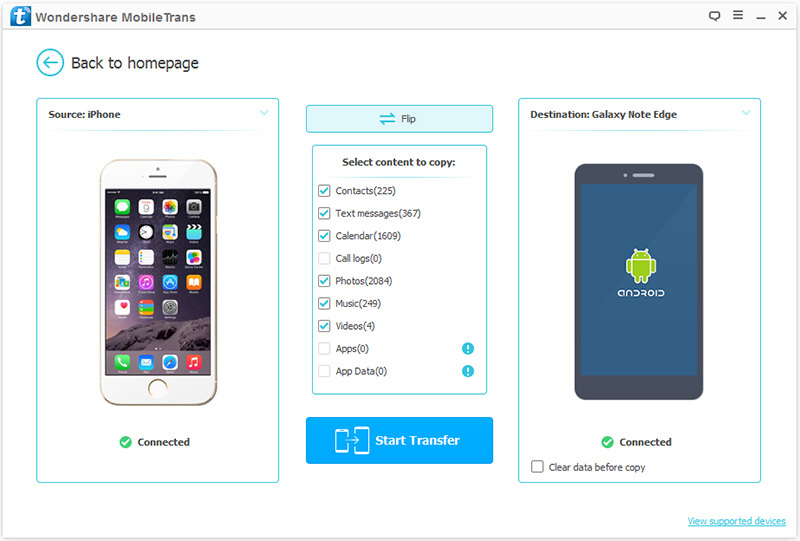 The software is named Mobile Transfer which can transfer the data like contacts, text messages, photos, videos, calendar and more quickly and securely from the old phone to the new cellphone including Samsung, iPhone, Huawei, HTC, LG, Sony, OPPO, ViVo, Motolora and so on up to 7000 supportive phones. You don't have to worry about the security of this software. Because safe, reliable and fast transfer speeds are features of this software. Here I will introduce the way that how to use this software . First of all, download, install and run this software on your computer. 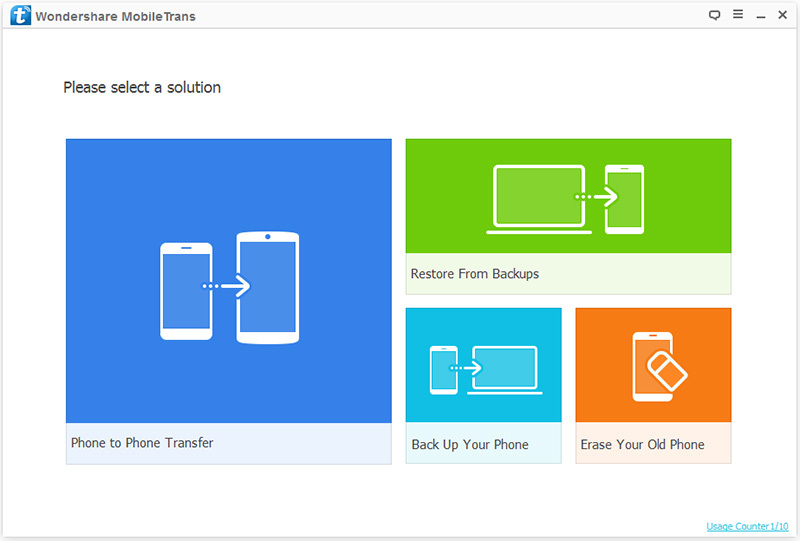 Open Mobile Transfer and then click on "Phone to Phone Transfer" and press "Start" in the main window. Then get both of your iPhone and the Galaxy S9/S9+ connected via theirs USB calbes. When your phones are detected by the program, choses the data you want to transfer and then click on "Start Transfer" to begin the process. The data will be transferred from the source device to the destination one. You also can use the "Flip" button to exchange their position. Finally, check if all the data that you need are in the Samsung Galaxy S9/S9+. 1. If the connection is interrupted, the transfer of your data will also fail. So please ensure that the connection between the phones and the computer is normal. 2. You can check the "Clear Data before Copy" box if you want to erase data on the destination phone before copying the new data. Copyright © 2016 Samsung-Android-Transfer.com All Rights Reserved. Android is a trademark of Google, Inc.